You can now download iOS 10.0.3 IPSW links for iPhone 7 and iPhone 7 Plus directly from Apple. Here are the details. Initially announced during this year’s Worldwide Developers Conference back in June, iOS 10 introduces a heap of new features designed to push the mobile operating system forward. 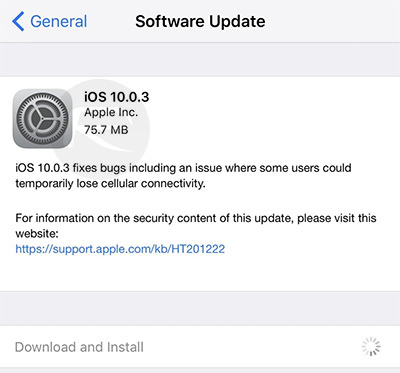 Version 10.0.3, which follows on from iOS 10.0.2, and comes when iOS 10.1 is current in beta testing, is a stinging example of Apple looking to fix bugs and security issues quickly and in a timely fashion. Though this version of iOS is available only for iPhone 7 and iPhone 7 Plus, at least for now. One of the primary focus of iOS 10.0.3 is to fix cellular connectivity issues that seems to be affecting the new iPhone 7 and iPhone 7 Plus devices only. Brand new iPhone models losing cellular connectivity is one news that Tim Cook and Apple didn’t wanted to hear, so with this release of iOS 10.0.3 that issue is finally fixed. Aside from that fix, iOS 10.0.3 doesn’t seem to contain much to write home about. Immediate investigation of the firmware doesn’t reveal any noticeable outward-facing changes that users can interact with on the iPhone. Instead, Apple has taken the tried and tested point release route of integrating relatively minor bug fixes and improvements that are designed to enhance the overall user-experience, hopefully making the iOS 10 experience on compatible devices a lot more fluid and enjoyable. The Cupertino-based company is also working on additional fixes and improvements for iOS 10, including the addition of the iPhone 7 Plus camera “Portrait” mode with iOS 10.1 that’s currently in test with developers. 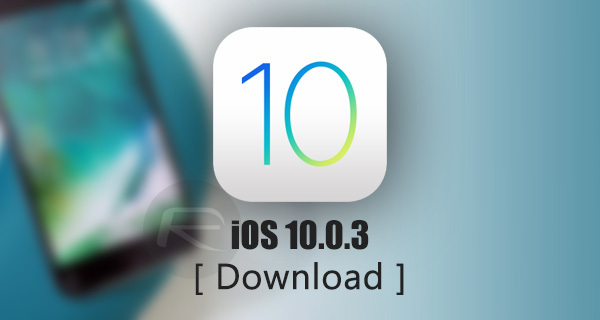 Anyone with a compatible iPhone, iPad or iPod touch is now able to grab iOS 10.0.3 as an over-the-air download with immediate effect via the Software Update (Settings > General > Software Update) section of iOS. Of course, the firmware file can also be downloaded and installed via iTunes if a fresh start is necessary or just felt like. In either case, remember to take an iTunes backup – no pun intended – before proceeding with the update. Why are you changing an old article and bumping it RP? You didn’t even include the links. The iOS 10.0.3 update is only out for the 7 series with cellular connectivity issues. No other devices got the update. Boot into DFU on your phone and download 10.0.3 and restore your phone to it.